middle of a rather wide cravat over the point of the elbow or knee, and carry the upper end around the upper part of the elbow or knee, bringing it back to the hollow, and the lower end entirely around the lower part, bringing it back to the hollow. See that the bandage is smooth and fits snugly; then tie in a square knot outside of the hollow. Figure 321 shows the proper application of a cravat bandage for the elbow or knee. Cravat Bandage for Arm or Leg.The width of the cravat you use will depend upon the extent and area of the injury. For a small area, place a compress over the wound, and center the cravat bandage over the compress. Bring the ends around in back, cross them, and tie over the compress. For a small extremity, it may be necessary to make several turns around to use all the bandage for tying. If the wound covers a larger area, hold one end of the bandage above the compress and wind the other end spirally downward across the compress until it is secure, then upward and around again, and tie a knot where both ends meet. Figure 322 shows the proper application of a cravat bandage for the arm, forearm, leg, or thigh. Cravat Bandage for Axilla (Armpit).This cravat is used to hold a compress in the axilla. It is similar to the bandage used to control bleeding from the axilla. Place the center of the bandage in the axilla over the compress and carry the ends up over the top of the shoulder and cross them. Continue across the back and chest to the opposite axilla, and tie them. 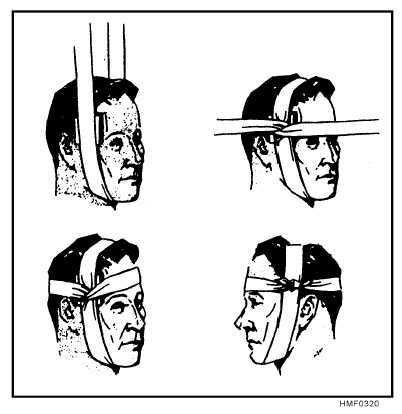 Do not tie 3-11 HMF0319 Figure 319.Cravat bandage for the eye. 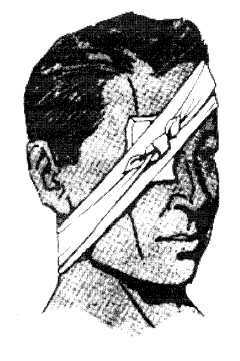 Figure 320.Cravat (Modified Barton) bandage for the temple, cheek, or ear.